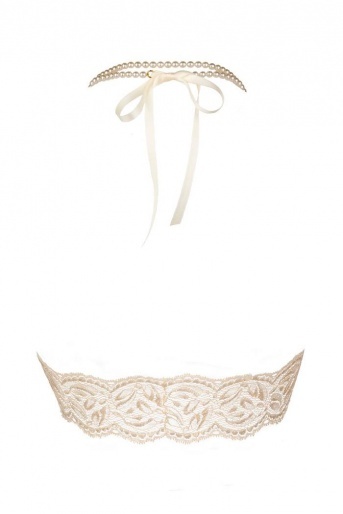 Bracli Bego's Lace Soft Bra Top with Pearl Halter. Bego's top by Bracli is made of luxury French lace that stretches to your shape and is available in red, black, ivory or white. Hand made, this luxury top is soft to the touch and has a double row of pearls which form a halter neck which ties behind your neck with a satin bow in the same colour as the lace. At the cleavage there are more pearls in a loop that gathers the lace to a sweetheart shape. Choice of lace colours - red, black, ivory, and white.